Do you like hot dogs? It’s probably one of the most recognizable foods popular here in America. However, hot dogs are popular all over the world, including Japan. In Saitama Prefecture, you can find this special hot dog that measures in at an astounding 55 centimeters. 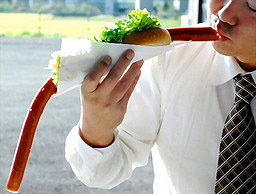 This extra long hot dog has become quite popular with customers, selling around 20 a day. The manager, Yasutaka Haga, is 73 and worked at U.S. military bases. I’m sure his love of hot dogs started there. I don’t think I could finish the entire thing. How about you?